Some children’s toys are a true classic and simply priceless. Take finger puppets. Their versatility (enjoyable for children of any age) and universal appeal (even adults love them!) is unlike any other toy in my opinion. Finger puppets are readily available and made in almost any form and material imaginable. Finding a truly unique and handcrafted fair trade design while supporting a group of artisans from a developing country is not so easy. 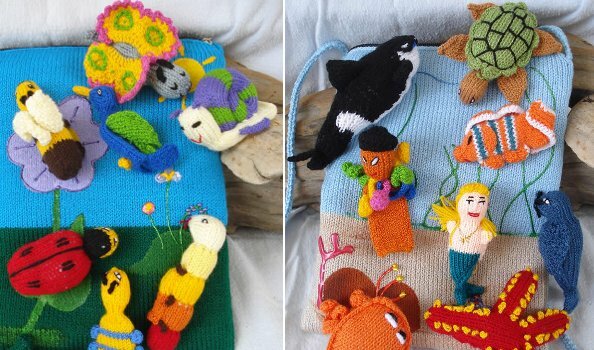 Crafts From Bolivia, a Canadian company that sources handmade products from the local indigenous groups of Bolivia, offers just that with their lovely and timeless finger puppets. Handmade with care and love, each set of puppets feature a knit pouch with a hand painted scene on the front, eight animal puppets and the ability to attach (by snap) the puppets to the pouch for more imaginative play. With six themes to choose from – including arctic, jungle, ocean and woods – and endless ways to interact and educate children, it’s a win-win toy. Each set is CAD$40 plus shipping. To order, email Crafts From Bolivia.